It is Stretch Tuesday again as well as the end of a wonderful three day Labor Day weekend. Hope everyone had a good and safe Labor Day. You can still smell the fantastic Nugget Rib Cook-off. Had 23 vendors’ barbequing at least 23+ different recipes of ribs (many of the vendors had several kinds of ribs to choose from). Plus they were cooking a lot of other tasty goodies. The Burners are returning from the Black Rock Desert after a fun art filled week. We are looking forward to seeing some of the art works that they created for Burning Man, the few that were saved. Almost all of the art work is burnt on Sunday at the conclusion of the festival when they light the bond fire of the huge stylized man hence the name “Burning Man”. Most of the Burners come to town to cleanup before they go home. Some hotels will not accept the Burners because they bring the Black Rock Desert back with them and clog the sewer systems! Yes, the car washes are packed with Burners’ vehicles and bikes. Now they are heading home. The incoming traffic is packed with vehicles for the Balloon Races next weekend. As well as the Air Race Crews for the air show in two weeks. Many of the planes are practicing this week and hopefully qualifying for the races in two weeks. It is fun to go to the “Pitts” and talk to the crews and pilots as well as seeing the planes up close. We enjoy watching the planes playing around in the sky just having fun. With the summer slipping away, we chose Fenton’s “Curtain Optic” pattern for this week’s discussion. It is a happy pattern with opalescent “smiles”. The Curtain Optic pattern dates from around 1926. Victoria Topaz is the color Fenton called this topaz opalescent color. 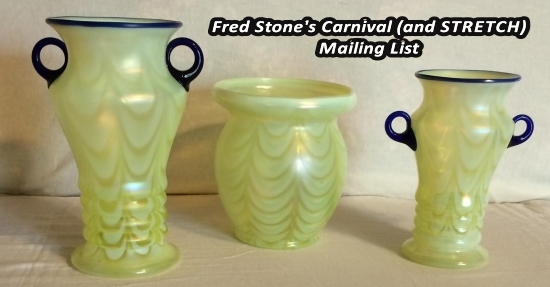 Some collectors call this pattern ‘Draped Opalescent Stretch Glass’. The pattern also comes in non-iridized glass. Frank Fenton said that it was made only in the Victoria Topaz. Many of the pieces have an applied dark blue handle and/or a rim of applied dark blue glass. Some of the pieces have an applied clear topaz handle. Have heard of an applied black handle and /or rim, but have never seen one; note that some of the blue handles are so dark that they appear to be black. Has anyone seen a real black handle? Some of the pieces have 4 rings or concentric ribs on the base of the glass. The pitchers and vases range in size from 10 1/4” to the milk pitcher at 8”. The pitchers and the vases were made from the same mould. Collectors seem to love or hate the Curtain Optic pieces as well as the Rib Optic which we will talk about next time. We happen to love both patterns, so if you have any extra pieces please let us know.